A Contemporary fit mock wrap top features two set-in front pockets, a logo O-ring above left pocket, left scissor pocket, one interior pocket, front and back princess seams, and side vents. 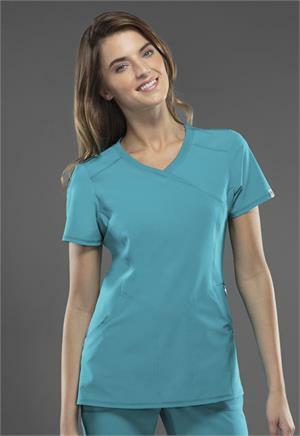 Stretch rib knit at the center back panel gives this top its slimming shape and allows for extra movement and comfort. Center back length: 26".